I see the signs to the Green School before I am anywhere near it. On my journey from Seminyak to the Ubud location I see many; signposts to the school are dotted all over Bali in the form of iconic, inscribed bamboo posts. These posts generally take up residence at key junctions and on the edge of rice paddies; informing travelers of the distance to the intriguing institution. 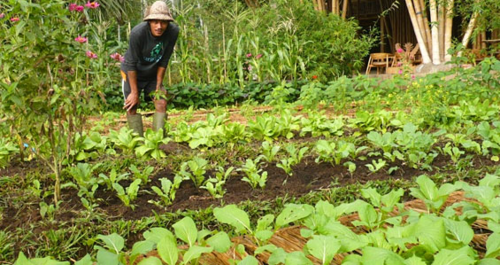 They act like evangelists that have strayed from their bamboo home and gone out into the field to spread the word of this innovative educational facility. 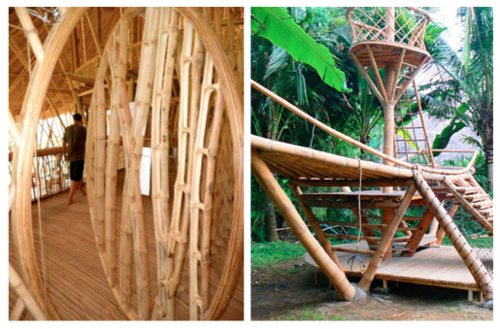 Located in the lush Ubud region, the Green School aims to raise a generation of children capable of living sustainably. Education is split between a traditional baccalaureate curriculum, a creative arts programme and the home grown ‘green studies’ – ‘a hands–on study which evolves from nature study to study of ecology to environment studies to studies of sustainability’. 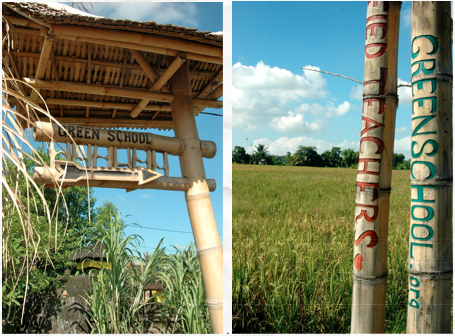 Despite the windy route [and thanks to the bamboo signposts] I quickly and easily arrive at Green School’s east entrance. Vast colourful flags mark my arrival at the destination. My guide, the charmingly named Zissou, promptly comes to meet me and we begin our tour. ‘To get from the east entrance to the west campus – the heart of the green school – we have to cross the kulkul river’ says the smiling Zissou. 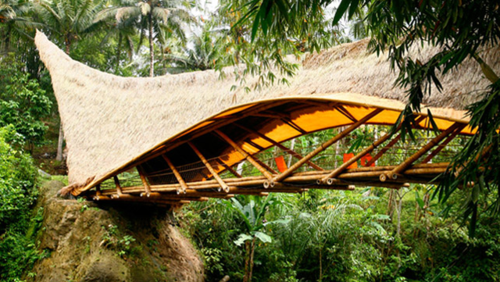 My immediate concern over questionable swimming skills are soon quelled by the sight of the breathtaking ‘kulkul bridge’; an alang alang structure that looks like its come straight out of Narnia. In fact, walking over the bridge feels a little bit like walking ‘through the wardrobe’. It feels like another world. Once over the bridge we find ourselves in a quaint rice paddy that has been planted and harvested by Green School students. This rice paddy is like no others that I have seen around Bali; the rice plants are huge and abundant and almost fall over themselves. Unlike other rice paddies where hybrid ‘super rice’ is planted due to its quicker yield, this field is full of indigenous Balinese rice. Touring the Green School is a little bit like walking around C. S. Lewis’ imagination. Kids’ climbing frames look set to sail on the ‘voyage of the dawntreader’, colourful animals call noisily from the school’s zoo, a chakra stone the size of a small pony glistens on the school grounds. This is not an ordinary school. Heck, it’s not even an ordinary dream. The headteacher’s office is a friggin’ treehouse. The fantastical element of the school, while being its most striking feature, is also what leads to its most instant criticism from outsiders. 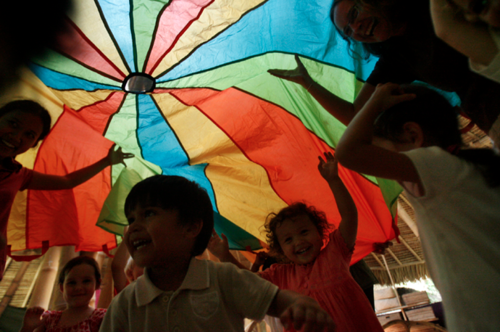 ‘How can such an environment possibly prepare children for the ‘real world’. But preparing children for the ‘real world’ is exactly what the green school is trying to do; a real world where non-renewable energy resources are dwindling, where over-farming is threatening the land and where animal extinction rates are at an historical high. Suddenly, the school ‘zoo’ doesn’t look quite so indulgent. In the bird enclosure, for instance, there is a breeding programme for the endangered, native Bali starling. The river vortex is not just an oversized science experiment, but a way to provide the school with half of its power [the other half comes from solar panels]. The pizza making classes aren’t just whimsical fun, but an interactive way to teach the children about bio-intensive farming methods; a sustainable solution for growing food. 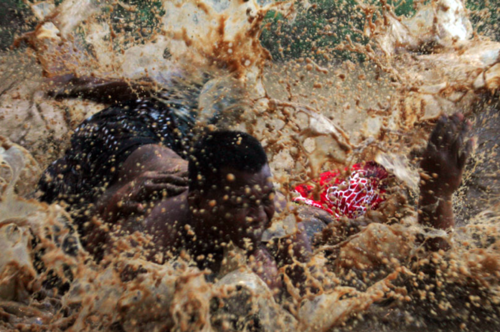 Even the mud-wrestling pit plays an important role in educating the students on cultural traditions. 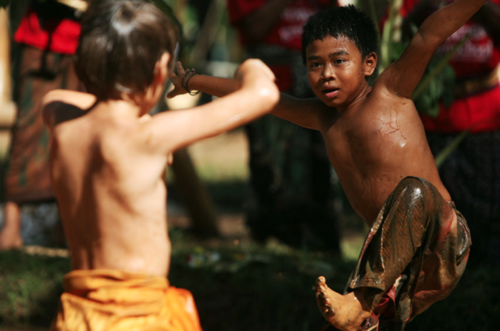 Every month, local Balinese come to join the school community in a night of mepantigan – a Balinese martial art practised in the mud. The importance of doing things locally also transfers to the admissions policy; thanks to generous donations the school runs a scholarship program for Balinese and Indonesian children. The programme aims to achieve a 20% ratio of Indonesian/Balinese to international students. 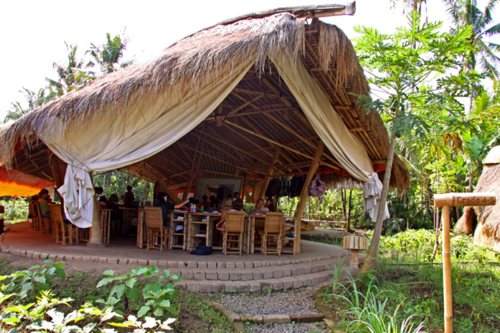 Green School wants to help these students make Bali sustainable. In the words of founder John Hardy, “Bali is a jewel. It is only 60 x 90 miles in diameter and we have to help educate people in order to help save it… help the Balinese and Indonesian people save their own patch of the planet”. 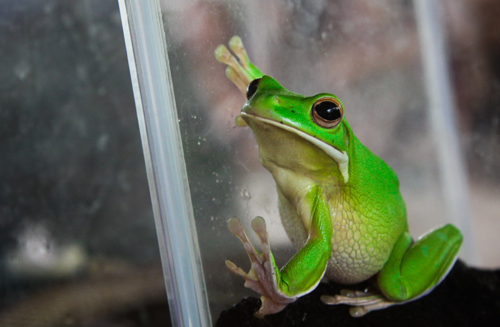 A Green school education is first and foremost about tackling real problems face on. At Green school imagination becomes reality. Ideas become action. And as Shakespeare wrote, ‘action is eloquence’.